How does hot tub hydrotherapy work? Initially recorded in the ancient Egyptian, Persian, Greek and Roman civilizations but still considered very effective today, hydrotherapy involves the use of water for pain relief and treatment. So it is basically an ancient health treatment that has stood the test of time well. Although it encompasses a number of approaches and methods, hydrotherapy is primarily concerned with manipulating the temperature and pressure of water for therapeutic purposes, such as stimulating blood circulation and treating the symptoms of various diseases. But how does hot tub hydrotherapy work? And what conditions can be treated? There is strong evidence to suggest that warm water opens up your blood vessels and in turn reduces blood pressure. Your skin and muscles will loosen and relax thanks to increased blood circulation as well. Hot tubs featuring hydrotherapy jets can provide you with a therapeutic massage for almost every part of the body. Focused streams of water, which are combined with warm air, can be controlled depending on how gentle or intense you want your massage to be. At HotSpring World, our patented jets are designed to target specific muscle groups, giving you the best possible experience every time. What’s more, we have a variety of different jets available to suit your unique wants and needs. For example, moto-massage jets produce two powerful streams of water that sweep up and down your back, while rotary precision jets focus attention on delicate areas like your wrists. But when you sit in a hot tub or spa, the water’s natural buoyancy will support approximately 90 per cent of your weight. This takes the strain away from your joints, allowing them to relax and recuperate. While warm water and massage jets will enhance this experience, the benefits of buoyancy can be enjoyed regardless of any additional treatment. Arthritis – Buoyancy will not only support and reduce stress on those aching or sore joints, it can also encourage freer movement and help build muscle strength without pain. Diabetes – A study in the New England Journal of Medicine found that people with Type 2 diabetes required less insulin, lost weight and benefitted from improved sleep after regular hot tub use. Pain relief – Hydrotherapy in a hot tub will stimulate endorphins, which in turn helps control pain and alleviate tension. 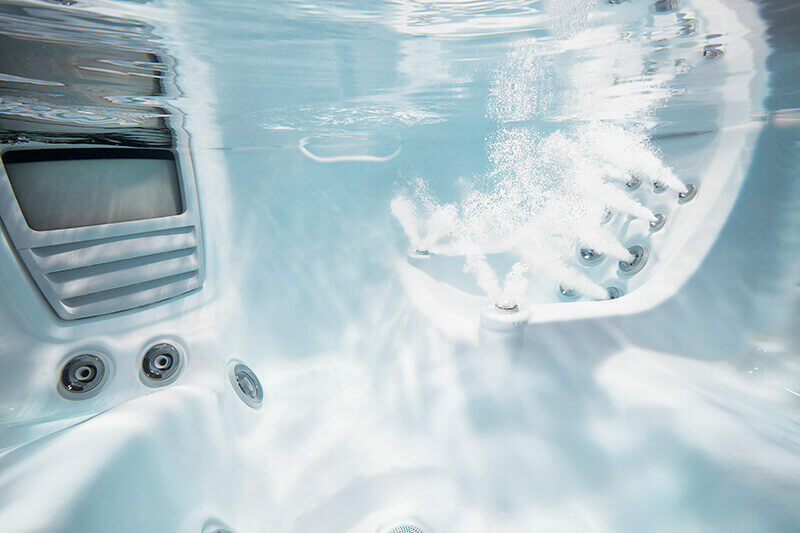 Stress – Physical and psychological problems associated with stress such as high blood pressure, headaches, digestive complaints, insomnia, depression, and anxiety attacks can be avoided through hot tub hydrotherapy. For help and advice regarding all these potential benefits, contact your local HotSpring World Showroom today. You can even take a hot tub for a test run, or test soak as we call it, if you want!